The future is here. 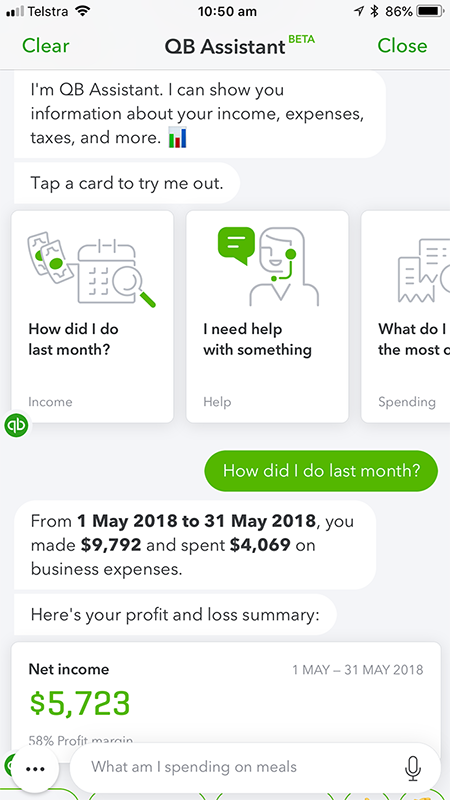 We’re proud to introduce the new QB Assistant, available on the QuickBooks Self-Employed app. We know that entrepreneurs and small business owners are busy, so we’re now making it even easier for you to access the data you need. The QB Assistant can help answer your burning questions in just seconds, giving you the answers you need to effectively run your business. Here’s how it works. How much have I made this week/month/year? What do I spend the most on? How many business kilometres have I driven? How many personal kilometres have I driven? What did I spend on meals this month/year? From here you can create a support request right from QB Assistant – and get a response from our customer success team via email. The QB Assistant is helping sole traders and entrepreneurs access their data in real-time to help you make business decision on-the-go. With just a tap of the screen, QB Assistant can access all your expenses, profit and tax information. You can easily compare your progress month on month, to help propel your business forward. Why not give QB Assistant a go today?